PhotoViz and ImageViz provide many image and file editing functions. Image editing functions are image resize, rotate, undo and reset. File operations are file information, open, save as, delete, print, exit and help. After selection, photographs are quickly rotated by clicking on the above icons. Photographs or images can also be rotated using the Rotate Dialog Box. Figure 4.1 shows the visual representation of the rotation results. As seen in Figure 4.1, images can be rotated in three orientations: 90 degrees clockwise, 90 degrees anti-clockwise and 180 degrees. If multiple images are selected for rotation, only the last selected image will be displayed even though rotation is applied to all the images. save the changes by clicking the Save As Icon. clicking the images with the mouse. This function is available in PhotoViz and ImageViz. 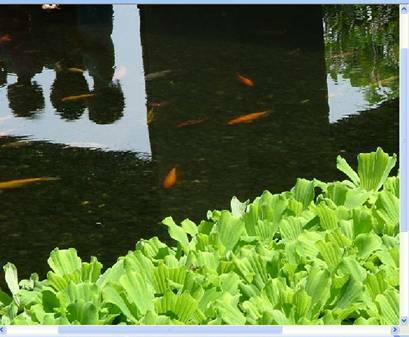 PhotoViz is a handy tool for resizing of multiple images for printing, emails, presentations or publishing to the web. The user can also resize a single image by clicking on the Resize Icon . 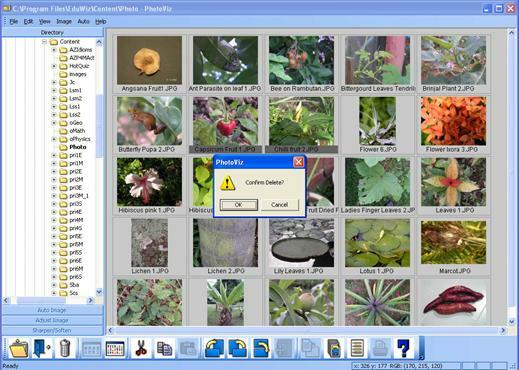 A dialog box shown in Figure 4.2 appears with the size of the currently selected image. Click on the checkbox if the proportion or the aspect ratio between the width and height of the image is to be maintained. If the width or height is changed, PhotoViz will automatically calculate the other parameter. In PhotoViz, the user can also choose to overwrite the existing file. The Overwrite Existing File checkbox is disabled in the ImageViz. This function is only available in ImageViz. ImageViz optimizes the viewing size of the image to the display area. This means that the image is automatically scaled to fit the display area (in gray). Most modern digital cameras have very high resolution and display image is usually scaled downwards to fit the display. For customized viewing, users can use the Zoom In or Zoom Out icons to scale the images. The Zoom Out Icon will reduce the image (Figure 4.3) while the Zoom In Icon (Figure 4.4) will enlarge the image in the display. The size of the original image is not changed. This function is available in PhotoViz and ImageViz. When the File Properties Icon is clicked, a dialog box shown in Figure 4.5 is displayed. In Figure 4.5, the first parameter is the file name. The file name is editable and can be changed. 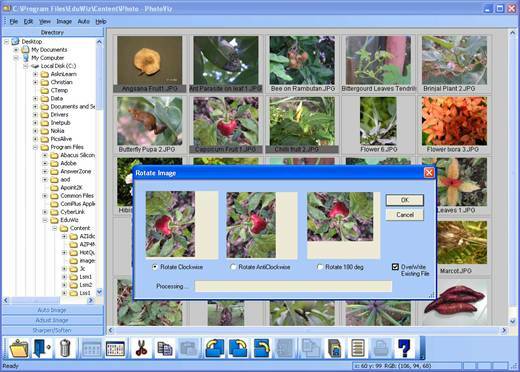 Two types of properties are displayed: image properties and camera properties. 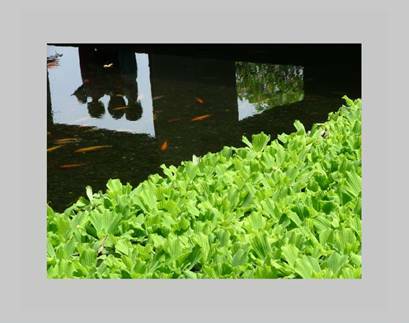 The image properties show the image name, image size (in pixels) and the number of bits per pixel. 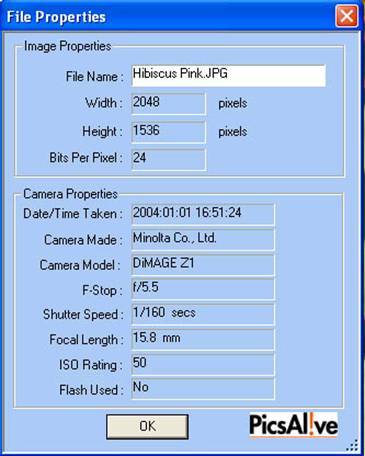 The imaging parameters are displayed in the camera properties. Note that these imaging parameters are only available in JPEG file formats only. Most camera manufacturers stored imaging parameters using the EXIF standard. The EXIF information displayed by PhotoViz is: Date/Time, Camera Made, Camera Model, F-Stop, Shutter Speed, Focal Length, ISO Rating and Flash Used. PhotoViz also preserves the EXIF information when a new file is created. This function is available in ImageViz. The Reset function restores the image to its original state. This function is useful when the useful wants to discard all the tuning process and starts over again. The Undo function on the other hand restores the image to the state of the previous operation i.e. only the last image operation is removed. This function is available in PhotoViz and ImageViz. It is advisable to sharpen the image before printing as printers tend to soften printouts due to limitations in color reproduction. This Image Open function is available in PhotoViz and ImageViz. The Save As function is only available in ImageViz. Images can be opened by double clicking of the image in PhotoViz or by clicking the Open Image Icon. This function is available in PhotoViz and ImageViz. Single or multiple file deletions are supported. This function is available in PhotoViz and ImageViz. Microsoft Paint can be launched within PhotoViz to further edit the image. This function is available in PhotoViz and ImageViz. The Exit Icon will quit the PhotoViz application. Remember to save the image in Image mode before clicking on the Exit Icon.